Did you know that prepackaged food needs a great deal of preparation before it finally appears in your kitchen cabinets? In this blog, we are going to discuss how nitrogen gas flushing is often helpful in the food & beverage industry. Companies operating in the highly competitive food and beverage industry know oxygen exposure can have a massive impact on product quality, as well as how long perishable foods remain stable for consumption. All processed foods that we consume on a daily basis are filled with food grade nitrogen. When processed foods are packaged, it is necessary to remove the oxygen from the packaging to keep that food safe for an extended amount of time. If oxygen is present with the food then oxidation will occur and the product will deteriorate and go to waste. Oxidation causes spoilage and deterioration of nutritional properties, observed through changes in color, smell, taste, and texture which in some cases can make consumers ill. These highly undesirable outcomes ultimately impact on both company reputation and customer experience. However, if the package is flushed with food grade nitrogen, oxidation is delayed and the shelf life of the food is extended. Have you ever shaken a pack of chips? If yes, you must have felt chips banging around in the packaging and felt the air filling up the bag. Surprisingly, that is not the air we breathe. The gas in the bag of chips is actually food grade nitrogen that doesn’t contain any oxygen. All snack bags are packed with nitrogen not to make them look bigger, but to protect the food inside the bag from oxygen exposure and physical damage. When nitrogen flushing is used, it displaces oxygen, cushions the content, and provides a pressurized atmosphere that prevents the packaging from collapsing. Using nitrogen packaging in this way helps ensure that more delicate foods, such as chips and crackers, won't get crushed in the bags where they're stored. Nitrogen does not react with foods like oxygen does so by using the nitrogen flushing process, the food stays fresh for a longer amount of time. Nitrogen gas does not affect the flavor or texture of the processed food making the food perfect for preservation. This gas is completely safe for this purpose. In fact, you’re exposed to nitrogen constantly because it makes up about 70 percent of the air you breathe. Can you save money when you use nitrogen for flushing? For Nitrogen flushing, it is better for industries to install on-site nitrogen generators instead of getting nitrogen delivered in cylinders. Nitrogen generators are cost-effective and let facilities have an uninterrupted supply of gas and generally receive a return on investment within a year or two depending on usage. 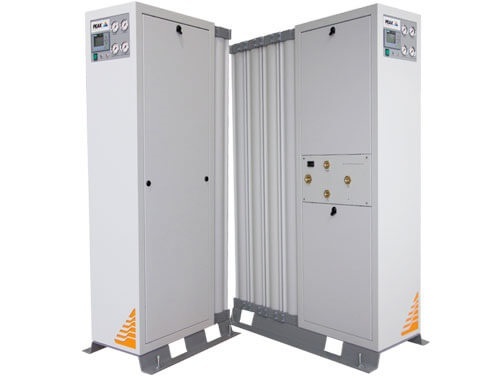 A single i-Flow Peak Gas Generation nitrogen generator can produce over 4000 liters per minute (7,212 SCFH) of clean, dry nitrogen gas, at purities ranging from 5% to 99.9995% (ultra-high purity nitrogen). i-Flow is also expandable. Instead of needing to purchase a new system or needing to increase the frequency of your cylinder deliveries if your demand increases, more columns can be added to your i-Flow system which future-proofs your facility. i-Flow is not only capable of meeting broad and varying nitrogen supply requirements, it can also help companies improve manufacturing efficiencies, reduce costs and meet environmental sustainability targets. With Peak Gas Generation's i-Flow nitrogen gas generator, you won't need deliveries and collections of your cylinder industrial gas supply. Instead you will make your bulk nitrogen onsite and be more energy efficient, all while reducing your carbon footprint and saving money. Since oxygen exposure can have a massive impact on product quality, a nitrogen supply is necessary in the food processing industry so premature spoiling and oxidation can be prevented. i-Flow is a highly cost effective, efficient, and reliable solution for supplying industrial nitrogen gas to a broad range of manufacturing and processing applications, such as nitrogen flushing and food processing. Why buy bulk nitrogen when you can make your own with Peak Gas Generation's i-Flow?